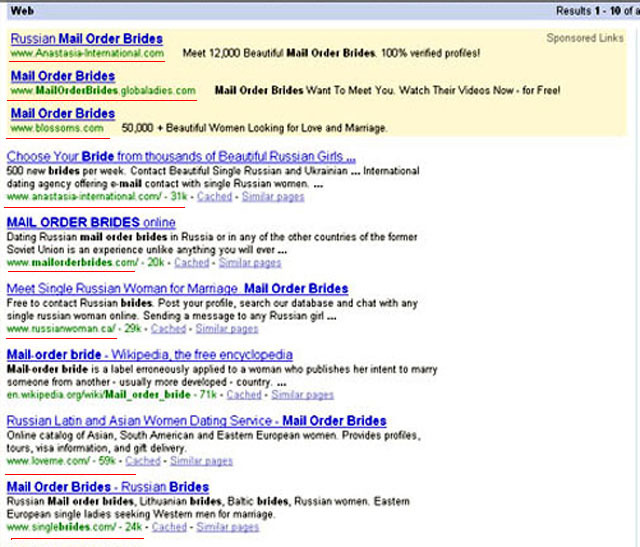 There is nothing more vile or disgusting to me then to see the term Mail Order Brides being propagated on the Internet and within our own Culture. NO WOMAN by virtue of her country of origin deserves to be labelled as a cheap commodity to be traded or sold. This is ESPECIALLY the case for the Russian and FSU Ladies that I have come to know and respect. In my mind this term is far worse then any racist slur that can be directed towards any group or nationality. It should be completely obvious that ANY COMPANY that wishes to market itself by using the Mail Order Bride Term is trying to paint a fraudulent and deceitful picture as to what is required to create a successful marriage and family. Worse yet... some of the other discussion boards about Russian and FSU women now carry advertisments from some of these agencies! I firmly believe that any Company that uses the Mail Order Bride term is trying to attract the worst possible candidates for marriage on both sides of the fence. They are doing this for the sole purpose of maximizing their subscription fee sales by giving false hopes to the widest number of Men possible. This is a very destructive business model that will only lead to more broken hearts, cynicism, and soul killing loneliness for countless numbers of people. Any company that uses Mail Order Brides in their marketing is giving you the biggest RED FLAG possible to avoid doing business with them. So on that note here is a simple top 10 list from Google of companies that promote themselves in this manner. There are numerous more from the total site count and I suggest that you can easily do your own research to find the rest. I urge you to respect the FSU ladies and most importantly to respect yourself as a Man by refusing to play this game and not falling for this degrading trap. 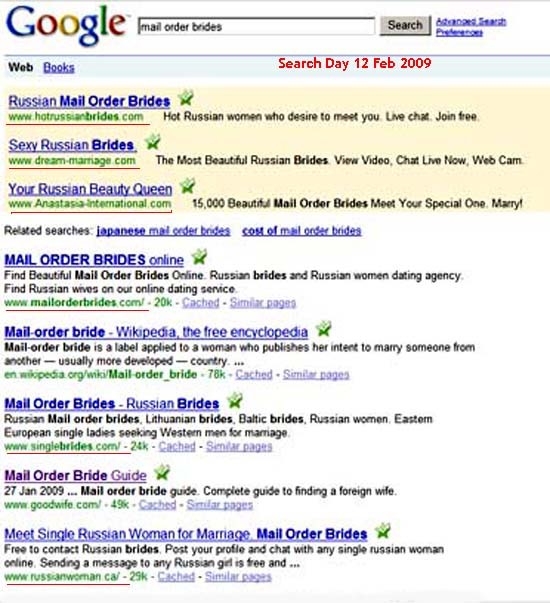 Why Feminism Promotes “Mail Order Brides"
Those of you who have read my previous posts know just how disgusted I feel when anyone refers to any Russian Woman as a “Mail Order Bride”. This was certainly the case yesterday when I found a Wikipedia article entitled “Mail Order Bride” that probably was written by a group of Feminists. The main implication of the article was that ANY Woman who is from a non-Western country who joins an introduction agency is a M.O.B. So if this is the case, then what does that make any American or Western Women who join services like Yahoo Personals, Match.com, or eHarmony? Is it possible to get married to any of “these women” solely through seeing their profile on a web catalog? Now for OBVIOUS REASONS, besides the fact that there is NO SUCH THING as a Mail Order Bride, to begin with, it is clear that this is one of the most derogatory and degrading terms possible for Women anywhere. Unfortunately it’s probably going to stick around for a while as long as certain nefarious groups continue to promote it for their own agenda. Unfortunately I’ve known that the M.O.B. label is often used by unscrupulous agencies and front companies who are trying to pass off Russian Women as cheap commodities that are easily attainable. The motive behind these groups are obvious. They simply wish to hook as many bottom of the barrel or “Lowest Common Denominator” Guys as possible and make a few quick bucks in the process. Unfortunately there will always be a percentage of guys who are dumb enough to actually believe this crap. This is disheartening enough but the really bad part is this. As long as Mail Order Brides can be used as a wide spread label against Russian and FSU Women, it serves as a Very Effective and Classic SMEAR Tool for the Feminists to SCARE OFF any Quality Western Men and Russian Women from attempting a relationship with each other. This is why M.O.B. is often the first tag that any Feminist would try to pin on anyone who see’s the value in looking beyond their own country for a lasting relationship. Clearly the underlying motive in slandering people with the M.O.B. tag is to prevent and discourage additional competition and the BEST way to do this would be to encourage the “Lowest Common Denominators” to establish relationships with each other under the “shadiest” of motives. It should go without saying that the probably of achieving lasting success or happiness with this type of pretense is quite low, that’s why highlighting any failures of M.O.B.’s works so well against our cause in the general court of public (but un-enlightened) opinion. Here’s another way to look at this. A company like Sony can put out thousands of excellent products that are of the highest quality but all it takes for their company’s reputation and their market share to slide dramatically are a few bad products. If I were Sony’s competitor the smartest thing I could do would be to quietly promote the bad products and make sure their problems are spotlighted in the general media. In the case of M.O.B.’s it actually get’s worse because this “branding” turns into a vicious cycle. The M.O.B. tag is widespread enough that even various agencies and websites have used it to market themselves to naive and lonely Men who may only be aware of this label as they try to search the Internet for true love. Many of these Men get burned in the process, the Feminists are laughing their asses off every time and saying.. “I TOLD YOU SO..” and a disgusting and soiled fan continues to spin and splatter everything in the room with it’s muck.. So if any of you people are planning on going through a Marriage Agency at the very least you can do is to AVOID any of them that use the M.O.B. tag. I just got two notes slipped through my door. would not fit through you letterbox so I left it with your neighbour"
"This is your friendly neighbour, I would like to invite you to my wedding"
My reaction "Can I get my money back on the long distance sales act"